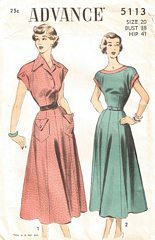 Vintage Advance pattern with unprinted pattern pieces circa 1950's. Uncut and in original factory folds. Size 20; Bust 38; Hip 41. One piece dress with or without buttoned front bodice closure. Kimono style sleeves with or without cuffs. Self or purchased belt. Side zipper or side snaps closing.